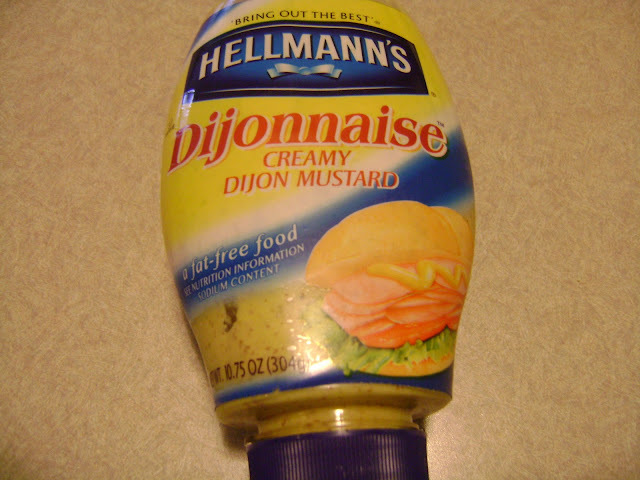 I recently discovered a new use for a terrific product...Hellmann's Dijonnaise. ( or Best Foods for those of you on the west coast ). This is a product I keep regularly in my fridge. I am not a hug fan of mustard...give me a ton of mayo to slather on things, and I am a happy girl....but mayo is very costly WW speaking...so ever since I read about Dijonnaise on Hungry Girl, I decided it was worth trying. One TBS. of dijonnaise is ZERO points+. This week, I decided to use it, instead of a butter spread or spray on my egg sandwich. OMG...I was instantly in heaven! The tang of the dijonnaise with the gooey egg middle is remarkable. When I use Nickels light 35 mulitgrain bread,( one point+ per slice) this sandwich comes in at 4 points+. Today I added a banana on the side for a very satisfying breakfast. I encourage you to give your taste buds a treat and try this combo. I like the egg to ooze out and get messy, so I cook my egg over-easy, but if runny yolks aren't your thing, you could cook the egg until the middle is hard! This would also make a terrific lunch as well! 1. Cook egg in nonstick fry pan coated with cooking spray to your desired doneness. 2. Toast two slices of the bread and spread the dijonnaise on each slice. 3. Assemble egg sandwich. Enjoy! Mine is almost empty! I need to pick up MORE! That sounds really good. I eat an egg sandwich once or twice a week. I don't like mayo, but maybe this would be good! Damn that looks good. For breakfast OR lunch!! I'll have to keep my eyes peeled for dijonaise! I didn't realize it was point free! Thanks for sharing the info, have a great day! I'm on SUCH an eggs kick right now. Great sandwich. Can I just say- I think its fabulous that you're on WW but still eat REAL food. I know a lot of people who have gotten on it and go for all the fake stuff. Bravo! I've never heard of that kind of mayo before. I'm not a huge mayo fan, but love mustard, so a little on a sammy is probably great! And no points is a plus too! I bet that would be good to add to egg salad sandwich! That looks really good. I'll have to try that!